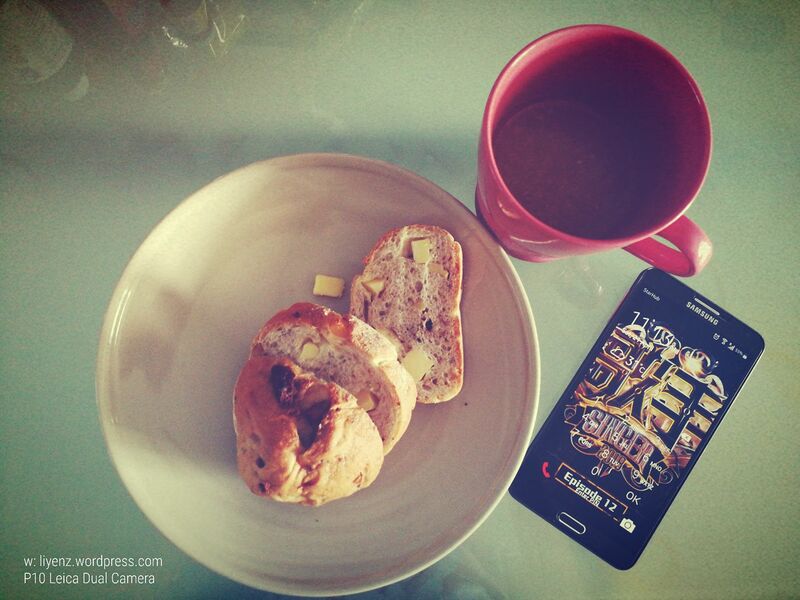 It has been a while since my last food review shared on 3rd March. Today, let me share another restaurant locates in Joo Chiat, Singapore. 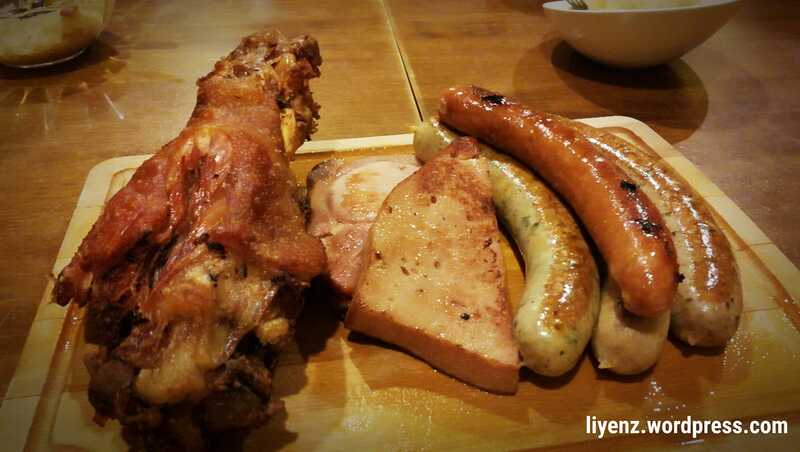 The authentic German cuisine restaurant at one of the quiet street in Joo Chiat area, the Werner Oven. A little bit history of this German restaurant, it is run by Auntie Nancy and the restaurant is named after her husband, Werner Hochbaum, a German man. There is a framed old newspaper featuring Auntie Nancy and her husband at the main entrance of the restaurant which did not have many fancy decorations and it looks a little old school. Okay, it is vintage. The restaurant is the first German bakery in Singapore, opened in year 1988. Ahha, around the same age as me. I visited the restaurant with a group of 12 colleagues for a farewell dinner. It was a large group of people and I think the restaurant did not really cater for such a crowd. So, we were first sitting together in a row of tables in front of their counter. And, because we were too crowded (and noisy), they moved us to another side of the restaurant. It did not improve much but at least, we were at one corner. The service is expected to be slow, judging by the waiters and waitresses working there are aunties and uncles, maybe they are family members or relatives. For such a crowd, our food served slow too and I did not get to take many pictures before we just too hungry for food. As the video I watched earlier before I started writing, Auntie Nancy described about the unique of German bread is sourdough, a multigrain, no fat, no sugar. It is exactly what I loved. 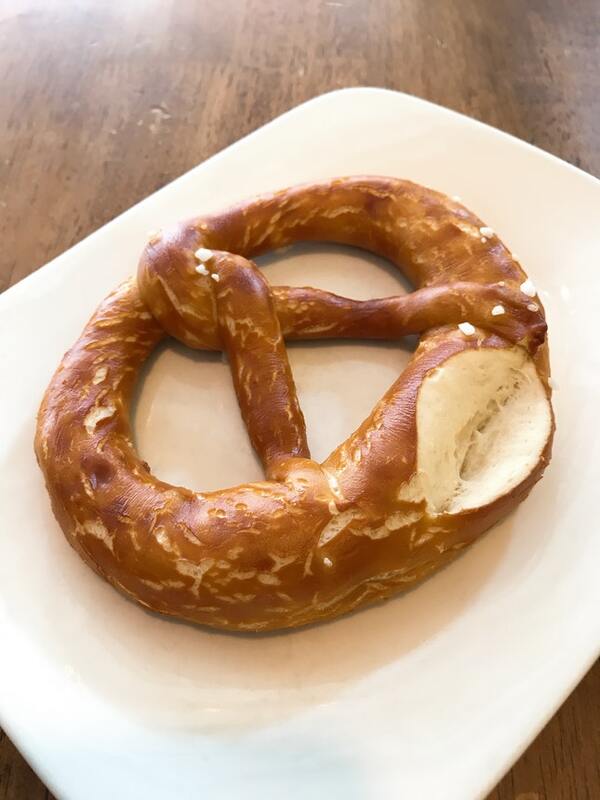 I tried their pretzels, served hot, which I tasted it was slightly salty to me but it is crunchy from the outside, soft inside. They served with a few of pretzels which I am not sure whether it was part of our orders. Photo by Burpple, Kel Song. While some like it, some do not. We waited for a while more, they served us with two bowls of soup. Yes for a crowd of 13 people, having two bowls of soup look like we are not afford to have each person a bowl. However, I think it is just nice for trying and it is one of the good try of the Beef Goulash Soup. It is appetizing and nice. We wanted to order more soup but they finished the soup before we could re-order. Again, I forgot to take its photo but I google one which is perfectly taken by another blogger. sauerkraut is a sour tasted, we did not eat it without our platters. And, finally, the main Schlachtplatte, the platters were served. That is the only 1 picture I took for that night and the platter consists of a pork knuckle, 4 large homemade sausages, Kassler and meatloft. It is often served with sauerkraut and mashed potatoes. This platter is for 4 persons which I think it is just nice for us because we ordered other side dishes as well. Overall, I am satisfied with this platter and loved the mashed potatoes. I did not try much the sauerkraut, just a bit to go with the sausages. Kasseler in German cuisine is the name given to a salted (cured) and slightly smoked cut of pork similar to British gammon. It can be either hot or cold smoked. Pork necks and loins are the most often used cuts although ribs, shoulders and bellies can also be used. We tried the fried calamari which is done perfectly good. It is a little pricey for the platter, however, judging by the portion and the taste, it is still a good try, if not, you can try for a smaller version of pork knuckle or farmer sausage which is good for a portion of one person. Address: 49 Joo Chiat Place, Singapore 427773.